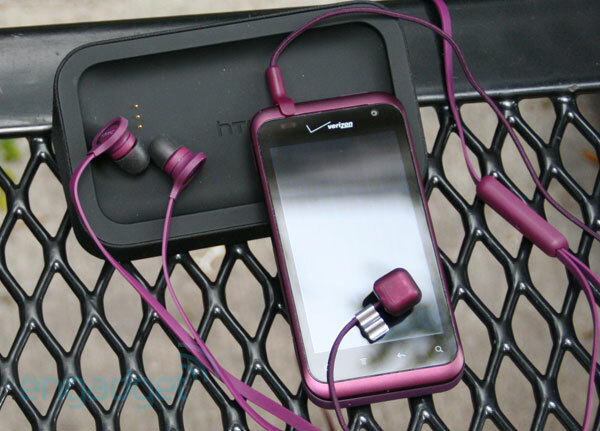 The HTC Rhyme is one of the newest additions to the Verizon wireless line-up, setting itself apart from the rest of the family since it's specifically for women -- or hipsters who like purple. This time around, the company decided to focus on the accessories, leading its marketing campaign with a glowing purse charm to avoid missing calls -- a fate all too familiar for gals whose phone is oftentimes buried at the bottom of a Louis Vuitton. Unfortunately, we've been skipped over when it comes to some of the features popular with higher-end, more macho phones like the Droid RAZR or the Galaxy Nexus. Sorry, ladies, no 4- or 4.3-inch touchscreen, no 4G LTE and certainly no dual-core processor. Instead, this phone is pretty run-of-the-mill, with a 3.7-inch capacitive touchscreen, single-core, 1GHz processor, a WVGA display, a 5MP rear-facing and VGA front-facing camera, as well as an 8GB microSD card. Running the newest Sense 3.5 UI atop Gingerbread, the Rhyme offers a unique user experience for those who like HTC's custom UI and, of course, the color purple. But is this phone powerful enough to keep up with the multitasking mayhem that is a day in the life of a modern woman? Jump past the break to find out. This mid-range phone and subpar accessories are hardly enough to keep up the modern, multitasking woman -- even if it is purple. How would you rate the Rhyme? The featherweight candybar-style phone looks almost as delicious as it sounds with a pearlized grape-colored border peeking out from behind the WVGA touchscreen. That accent extends around the display, cutting across the back of the phone, much like a piece of ribbon would wrap around a present -- almost identical to the Status or Flyer tablet, only with a dose of Dimetapp purple. 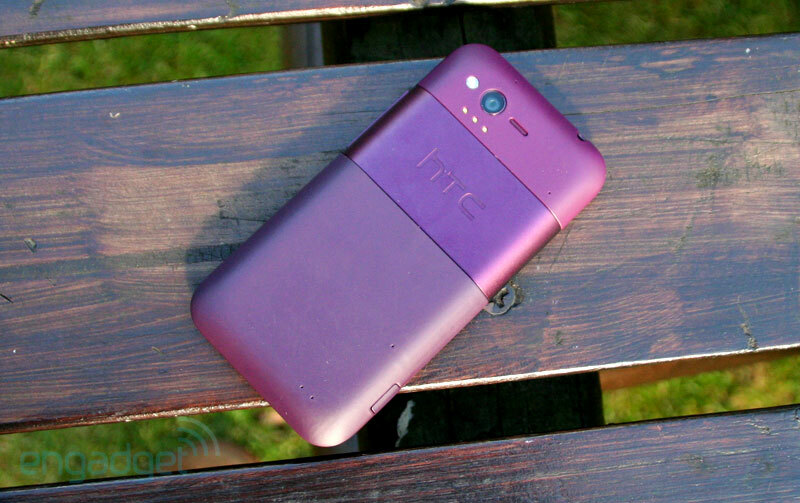 A more subdued shade of plum makes up the rest of the back, which is constructed out of HTC's signature soft-touch plastic. Turn the phone over and you'll find a single LED flash, 5 MP camera, a speaker and some electrical charging points -- not to be confused with the inductive variety on the Droid Incredible 2. By popping off the battery cover, users will see a 1600mAh battery along with an 8GB pre-installed microSD card. Embedded into the back, there's the phone's antenna. You'll get a sneak peek of what's inside the phone through the translucent casing, but that's about all you'll be able to see as the battery is non-removable, much to our disappointment. 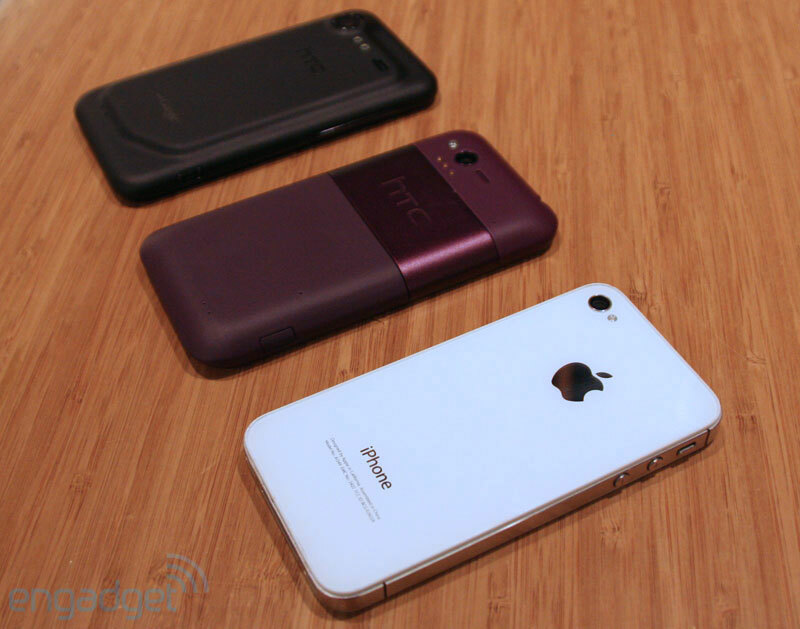 Although rather petite, the 4.58-ounce (130g) phone felt solid, similar to some other HTC phones. Unlike slick plastic handsets and the shatter-prone iPhone 4, the soft material used here makes the Rhyme easy to grip, and inspires some confidence in its durability. Oddly, though, this petite phone wasn't any more unwieldy than the 4- and 4.3-inch handsets we've tested recently, so we're not really sure why HTC skimped on screen. Maybe the company assumed our manicured mitts couldn't handle something larger. The phone measures 4.69 x 2.39 x .43 inches (119.13 x 60.7 x 10.9 mm) with a similar, but not identical layout to the Droid Incredible 2. Along the top, you'll find the power button coupled with a noise-canceling microphone and headphone jack. The right edge houses a volume rocker, with a micro-USB socket and charging port tucked on the left. The micro-USB port is protected by a thin piece of plastic so precarious, we're surprised we didn't break it in half already. Lastly, the bottom of the phone rocks a secondary mic, helping to make calls sound reasonably crisp. 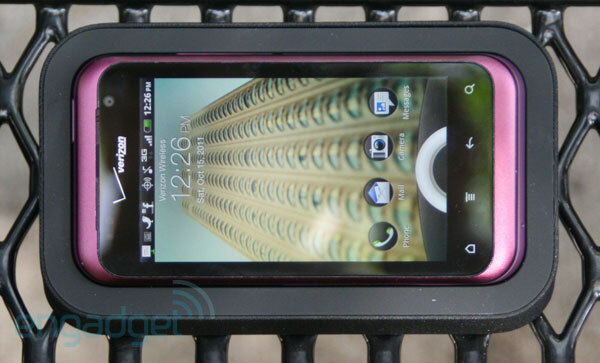 The 3.7-inch WVGA touchscreen features the VGA front-facing camera, flashing LED notification light and Verizon logo. At the bottom of the screen you'll find your requisite haptic touch controls, including home, menu, back and search buttons. On the backside of the camera there's an LED flash, 5 megapixel autofocus camera, a low powered speaker and the aforementioned electrical charging points. The WVGA display is bright and sharp, offering generally impressive viewing angles from far left or far right -- although, the quality was impeded in strong sunlight. As far as clarity goes, the Rhyme boasts a 252ppi screen compared to the iPhone 4's 325ppi, making it lower-end, but no slouch as far as screen clarity goes -- doing the photos we snapped in Central Park justice. The Rhyme features Qualcomm's MSM8655, a 1GHz Snapdragon processor with Adreno 205 GPU – the same processor found in the Incredible 2 and the HTC Thunderbolt. Sure, it's no dual-core processor but it's still snappy and powerful with 768MB of RAM to keep it trucking. Switching between screens was responsive, with quick animations keeping up with us. Much to our dismay, we started to see some lag once the apps were opened, taking an extra second to respond. Similar to the Incredible 2 and the Thunderbolt, the Rhyme clocked a Quadrant score of around 1,400 to 1,700. Radios include the standard WiFi 802.11 b/g/n, Bluetooth 3.0 + EDR, CDMA / EVDO Rev. A and GPS / AGPS. The sound was acceptable during regular calls, but reminiscent of a tin can while on speaker -- especially when compared to calls made on the iPhone 4. One of the biggest advantages of this phone was the battery life. With a promised 440 minutes (around seven hours) in active use, we were able to get through the entire day and into the night without having to recharge. After using the phone throughout the day to snap photos, check emails and send out a few tweets, we left the phone unplugged overnight and still had some juice left over in the morning. Putting the battery to the test, we ran a video on loop until it sucked the battery dry -- a task which took around seven and a half hours -- quite an impressive feat for an Android phone. When you compare this phone to one like the HTC Thunderbolt, which sucked the battery dry in around five hours and 47 minutes, not having 4G almost seems like an upside. HTC is really pushing the accessories with this phone, including all of them with purchase. The main star is the purse charm, which plugs directly into the headphone jack and lights up when an incoming call is received. More of a novelty than a useful accessory, the charm did help us spot a call in a dimly lit restaurant, but was barely noticeable in daylight. Since it flashes for five minutes after the call is received, the light is really nothing more than a glorified girly notification LED. Another downside is the hardware designed to attach the orb to a purse. Sadly, the piece is completely inflexible, making it impossible to attach the charm to most standard leather bags. If you do manage to attach the glow ball to your pocketbook, the long cord will act as an anchor, making it easier to retrieve the phone buried under a pile of receipts, doodads, packets of gum and other miscellaneous junk that tends to collect at the bottom of purses. The other signature accessory is the tagliatelli-like, tangle-free headphones. The headphones barely stayed in our ears and delivered scratchy and downright embarrassing sound quality. The best made and most useful accessory is the charging cradle, which holds the phone at an angle perfect for watching movies or repurposing it as an alarm clock. 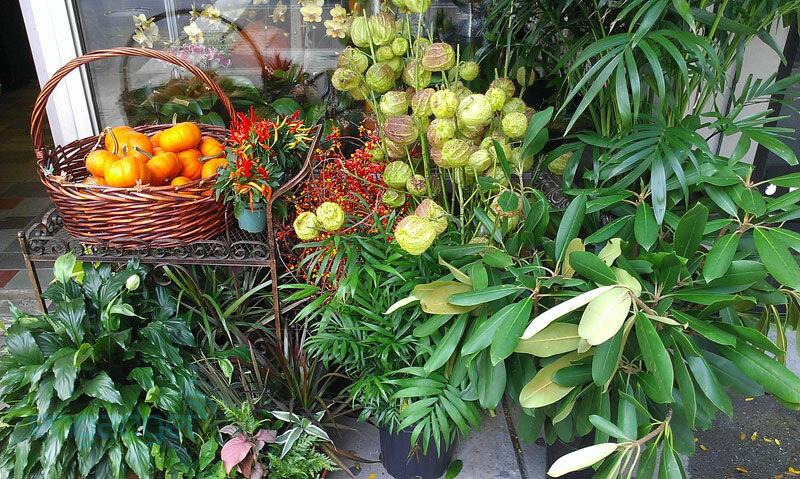 One of the things we like most about the Rhyme is the camera function. Although not extremely top-of-the-line, the feature lets us add fun effects like Vignette and Distortion without having to download an additional app and relying on internet access to doctor our photos. Like a point-and-shoot, the phone's autofocus camera allows users to select options like action, portrait burst, HDR and panorama to optimize mobile picture-taking. For more established photographers, there are also manual settings like white balance, ISO and resolution for even more customized tweaking. The rear-facing camera snaps 5MP stills, while the front-facing one maxes at VGA resolution. The backside shooter also captures sharp 720p video and has options for lower resolution capture and slow-motion speeds. The front-facing camera can capture video as high as 640 x 480, and has options for low resolution video as well. When it comes to recording camera flicks, sound quality was decent, especially when capturing the general sounds of New York City – clearly the star in all our videos. In both video and picture-taking mode, the camera can be adjusted by tapping the screen along with zoom using the volume rocker or slider option. Overall, the daytime photos we shot were crisp and clean, while photos taken in low light suffered a bit, although the function did balance the light somewhat effectively. 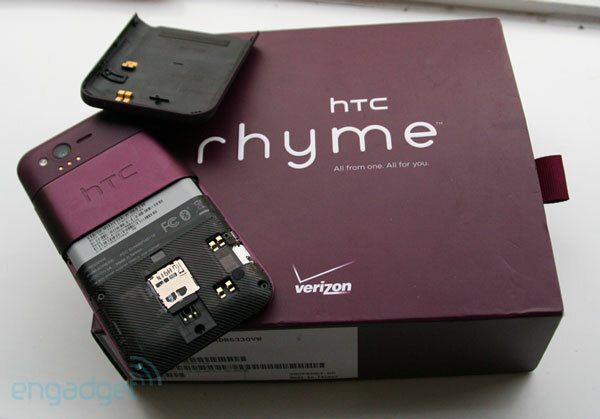 Like HTC's other phones, the Rhyme runs the company's custom Sense UI on top of Google's ubiquitous OS. This is the first phone to offer Sense 3.5, complete with new animations and a revised look and feel. One of the things you'll notice right off the bat is the home screen, which has widgets placed neatly to the side rather than under the clock. The clock and weather widgets have moved to the bottom right corner, and though they remain the focus of the home screen, they're markedly less in-your-face. Aside from the tweaked home layout, one of the main differences is the ability to remove panels on the screens, decluttering the sometimes chockablock feel of Sense when compared to previous versions. This particular flavor of Sense is a bit different from the company's previous offerings, although it still has all the signature features that make Sense Sense. One of the major things we noticed about the latest version is the omission of the Verizon bloatware tab in the apps section. Unfortunately, this doesn't mean the phone is free from crapware, but at least there will not be a signature Verizon tab reminding you that it exists. You'll still have to deal with V CAST Music, VZ Navigator, V CAST Videos and other miscellaneous apps that we really have no use for. The amount of unnecessary apps and widgets like FriendStream clutter the phone and almost cheapen its Android integrity. The phone was incredibly fickle when it came to email, forcing us to continually set up our mail time and time again, oftentimes giving us the error message "getting token failed." For the most part, we had trouble accessing our mail reliably through the Gmail app, although we were able to access it through the notifications bar upon occasion. When searching for a solution, we found that other people were having the exact same problem, to which the major recommendation was to remove mail settings and start again -- what a pain. When the HTC Rhyme first arrived on the scene, Verizon's major focus seemed to be on the marketing angle rather than the meat of the phone. Widely understood to be a lady phone, the Rhyme's promise as a piece of hardware got lost amid stereotypes painting women as ditzes who need a sparkling light to find their phone underneath tubes of lipstick. Surprisingly, HTC has adamantly denied that this is a phone geared towards women. Of course, the phone itself isn't that bad – the hardware is beautiful and it has a 1GHz Snapdragon processor to power it through snappy transitions and multitasking. But why doesn't the lady phone have a dual-core processor, 4G LTE or perhaps a 4- to 4.3-inch higher quality screen? Considering that the accessories are the main selling point for the phone, it's remarkable how poorly made they are. The main one -- the charm -- wouldn't attach to any of our favorite purses and the glowing orb was hardly bright enough to alert us of an incoming call on a sunny day. Add in cheap headphones that barely stayed put in our ears and overall, it seems like the Rhyme is just another run-of-the-mill Android smartphone. Beyond the hardware, liking the phone comes down to liking Sense. To us, a cool weather and clock widget aren't enough to save us from the annoyance of things like pre-loaded Verizon crapware and FriendStream, but as always, it's a matter of preference. If you love purple and you love Sense, then the Rhyme's for you. For the rest of us, we'll just stick with "male" phones.